The railway owned by the Cattybrook Brick Co. Ltd. at Almondsbury, Gloucestershire, is interesting in many respects, not the least being its gauge of 2ft 10in. The home-made locomotives at present have Morris "Commercial" engines but have had all sorts of others previously, while the track has to be seen to be believed. Flat bottom, bullhead, bridge and street tramway type rail are all evident, with sprung, ordinary and stub points! On the line are about ten wagons of a local design, adapted to the peculiar tipping arrangements. The wagons at present in use were probably built half a century ago although the design dates back to pre-1900 when the railway was horse-worked. The iron bodies were purchased (possibly built by Charles Hill of Bristol) but the wooden frames were made by the Company. Train en route from the pits, December 1965. 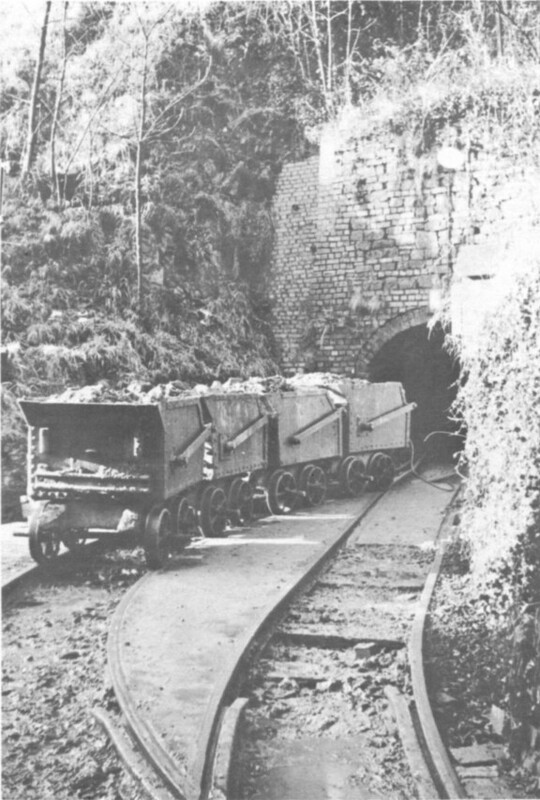 Wagons at the incline foot, December 1965. Mechanical loading of wagons at pits, December 1965. The body has a capacity of about 34½ cubic ft. There is a door at one end which is prevented from opening by a stop in the floor. The frames are wooden beams 6in by 8¾in by 4ft 5in with transverse members. The wheels have a diameter of 17in, the wheelbase is 25in and the back-to-back measurement is 31½in. The shape of the body allows the wagons to be shunted close together, an advantage at the foot of the incline where space is restricted; indeed, superficially a set of wagons looks like a single articulated unit. However, coupling is by a D−shackle, chain and hook on the body. The buffers, lengths of flat bottom rail, are welded to the body also, and not to the frames as is more usual. In use, the wagons are run as sets of four. 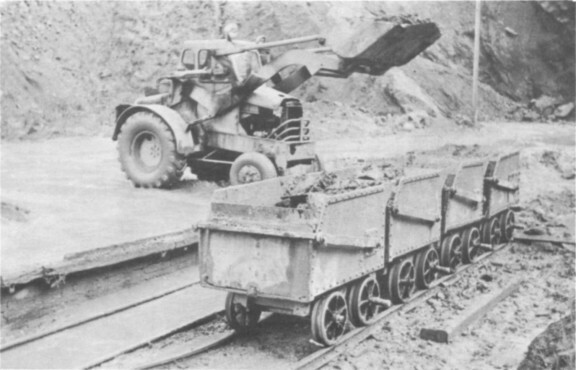 A set is loaded by mechanical shovel at. 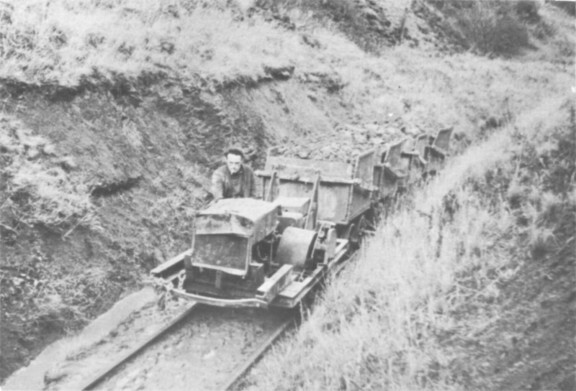 the pits and towed by a home-made petrol locomotive to a loop, after which it is propelled to the foot of the incline. This being single track, the wagons are hauled up individually, the method of tipping being shown in the diagram. As the wagon is hauled up, there is no tendency for the door to open as both cable and door pivots are in line. At the tip, the leading wheels drop into a "U" formed by bending the rails. As the winch is much higher, the door is lifted up until the cable and pivots are again in line when the body tips and the load is emptied. It the cable is wound further, the whole wagon is tipped up but the extended rear axles catch in lineside stops and prevent it from going over too far.